(Phys.org)—Researchers at the University of Illinois in Chicago have developed a special set of body modules that provide wearers with extra-sensory perception as to who or what is nearby. The design could help the blind navigate safely or even support cyclists or drivers as additional safety support in traffic. Called SpiderSense, this is a wearable display that can pick up ultrasonic reflections from objects. 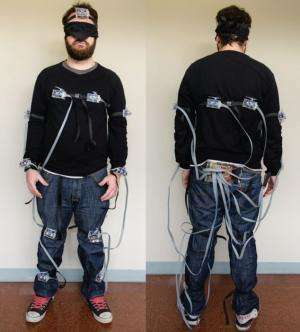 SpiderSense can also allow the wearer, even if eyes are closed, to navigate. The researchers behind SpiderSense define it as a wearable device that projects the wearer's near environment on the skin. 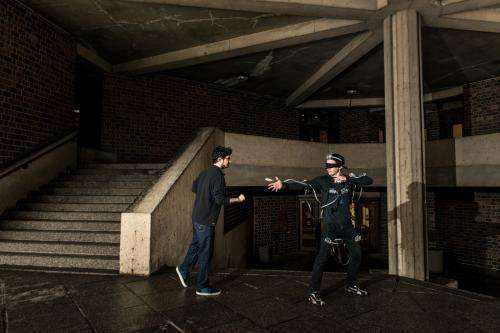 The suit gives the user a special directional awareness of surrounding objects. They have explored a scenario where multiple sites over the body, rather than just hands, are fitted with transducers. These transducers relay information about the wearer's environment into tactile sensations. As the researchers noted, sensory receptors that cover the skin provide opportunities for conveying alerts and messages. They set about to design a wearable device that could also relay alerts and messages. When the ultrasound detects someone moving closer to the microphone, the arms exert increased pressure on the body. 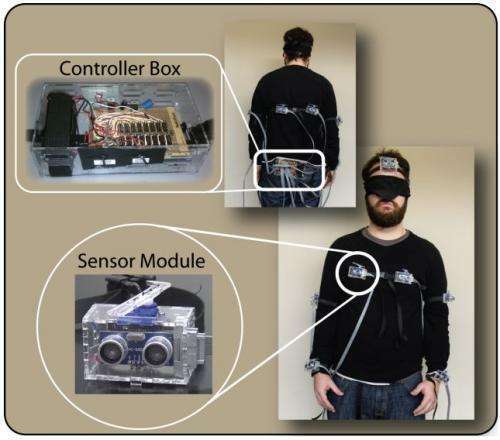 The SpiderSense design and experiment results are presented in their paper, "Sensing the Environment Through SpiderSense," by Victor Mateevitsi, Brad Haggadone, Jason Leigh, Brian Kunzer, and Robert V. Kenyon. Does their concept work? In one experiment, students on campus were asked to stand outside, blindfolded, and feel for approaching attackers. Each wearer had ninja cardboard throwing stars. If the test subject sensed someone approaching, then that participant was asked to use the stars. "Ninety five per cent of the time they were able to sense someone approaching and throw the star at them," Mateevitsi said. While experiments showed success in outdoor environments, results of indoor testing were not as successful, where sensor modules overwhelmed the user with tactile feedback. The team intends to further develop the gear by adding more sensors. They suggest several practical applications. The gear could help the vision-impaired get around more easily, and they plan to start trials with the visually impaired. Another application might be as compensating support for the hearing-impaired. Still another could be as a supplementary aid in spatial awareness. They said that bicyclists, for example, could have one sensor on each forearm facing outwards and two sensors on their back, being aware of passing or incoming traffic. Their paper will be presented at the Augmented Human International Conference in Stuttgart, Germany, on March 7.